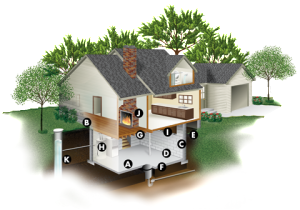 Any home can have a radon problem, no matter what type of foundation it has. If you have a basement: A basement provides a large surface area in contact with soil material. Radon can enter through cracks in the concrete, or through floor-to-wall joints or control joints. Since many Illinois homes use their basements as living space, exposure to radon can be further increased. But radon can enter a home regardless of whether or not there is a basement. Illinois homes commonly operate under a negative air pressure, especially during the heating season. What this means is, the air pressure inside your home is typically lower that the surrounding air and soil. This creates a vacuum that pulls soil gases, such as radon, into the home via pathways. Even if the ground around the house is frozen or soaked by rain, the gravel and disturbed ground underneath the house remains warm and permeable, attracting radon gas from the surrounding soil. Stack Effect: As warm air rises to the upper portions of a home, it is displaced by cooler, denser outside air. Some of that displaced air comes from the soil. Down Wind Draft Effect: Strong winds can create a vacuum as they flow over the top and around the home. Vacuum Effect: Combustion appliances like furnaces, hot water heaters and fireplaces, as well as exhuast fans and vents, can remove a considerable amount of air from a home. When air is exhausted, outside air enters the home to replace it. Some of this replacement air comes from the underlying soil. Radon levels are often highest at the entry point – typically in the lower part of a building. As radon gas moves upward, diffusion, natural air movements and mechanical equipment (such as a forced-air ventilation system) distribute the radon through the home. Radon gas becomes more diluted in the upper levels of the home because there is more fresh air for it to mix with. Greater dilution and less house vacuum effect occur when the house is more open to the outdoors, as during the non-heating season. This generally results in lower indoor radon levels in the summer compared to the winter.